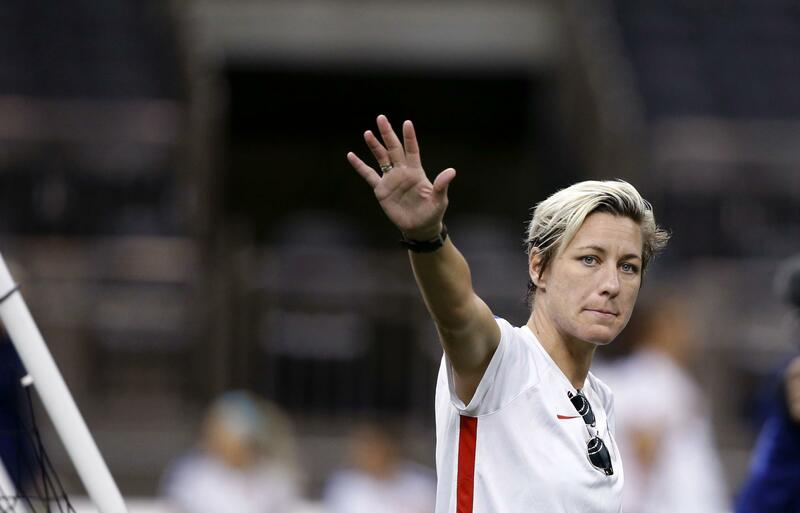 U.S. forward Abby Wambach waves to fans at the end of a practice session Tuesday in New Orleans for Wednesday's final U.S. victory tour match, against China. Wambach will be playing in her final match with the team. Tonight marks the end of an era for the U.S. Women's National Soccer Team. The World Cup champions play their final Victory Tour match against China in New Orleans. It's also the final game for one of their longtime stars: Abby Wambach. She ends with 184 goals scored in international play. That's the most by any player — man or woman. She won two Olympic gold medals (2004 and 2012) and a World Cup (2015). She was named FIFA's World Player of the Year (2012). She helped the University of Florida win its first-ever national championship as a freshman (1998). "Her superpower on the field is absolute fearlessness. Diving headfirst into soccer balls. Scoring goals by any means necessary. But, she says her body won't let her play like a champion anymore: 'Running and the game is not easy by any means. It's harder than it ever used to be.'" One of Wambach's signature header goals came in the 2011 World Cup. The U.S. was playing Brazil in the quarterfinals and was behind late. Wambach scored the equalizer goal in stoppage time. The U.S. would go on to win that game and advance to the championship game. Speaking to reporters Tuesday, Wambach said the sport has changed so much since she first played for the U.S. National Team in 2001. "It's evolved. It's harder than it ever used to be. The standard is even higher. That's the way it should be. [But] the body just knows when it knows and your mind is at the right speed but your body just isn't doing what it was capable of doing even three years ago." Her teammates were quick to gush about Wambach and say how much she will be missed. Carli Lloyd: "She gets us going. That's her thing. She's a vocal leader. She curses. She screams. She's the type of player that really will just throw her body out there, do whatever possible." Morgan Brian: "Abby means everything to the team on the field and off the field. She's legendary to every single one of us ... especially me." Alex Morgan: "She has been the face of women's soccer for so many years. Abby will be a soccer player talked about for many years." Now that her career is ending, Wambach says she plans to become a fan and cheer on the team as it aims to win another gold medal at the Olympics next year in Brazil. She also plans to continue to be outspoken. In an interview with NPR's David Greene on Morning Edition on Wednesday, Wambach lamented the lack of corporate support for women's soccer. She said a record number of people tuned in for the 2015 World Cup final between the U.S. and Japan. "Thirty-one million people watched that game. The most that's ever been watched by men or women playing the game we love. To me, hey sponsors, hey corporate America, hey people, did you hear what I just said? More than the men's team ever!" She has been critical of the huge pay differences between male and female soccer players. "Overall, as a culture, we have been so imprinted on the fact that women make less money, get fewer opportunities. I'm very passionate about it because the amazing part about equality and being treated fairly and being treated humanely, is that it doesn't cost a cent." Tonight's game in New Orleans at the Superdome will be Wambach's last. Coach Jill Ellis says she'll play in the starting lineup and captain the team as dozens of her family and friends watch from the stands. Fox Sports 1 will broadcast the USA-China game beginning at 8 p.m. ET Wednesday.